If you usually buy your pies at the grocery store (either frozen or from the bakery), why not take a little extra time and make your own this year. You'll save money, and, I promise, homemade pies TASTE better! There are two traditional types of pumpkin pie. One version is made with evaporated milk and is generally lighter and a bit spicier. The other, "custard style" version, is more dense and made with condensed milk. 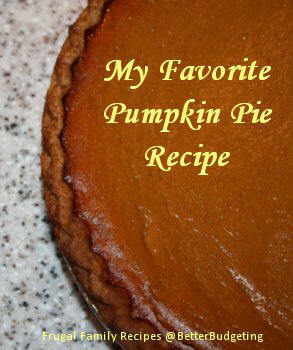 Although I have never met a pumpkin pie I didn't like, the later is my favorite. Years ago, the only frozen pumpkin pies you could buy at the grocery store were the traditional custard style. Hmmm. When I was a young child my maternal grandmother made the spicier pumpkin pie (with cloves and evaporated milk) every holiday and my paternal grandmother made the creamier pumpkin pie (homemade, with condensed milk). I always loved the later more so that is what I have been making every since. It really is just a personal preference. However, whichever version you make will probably become your family's favorite too. So, I do hope you will try my favorite recipe! Today, there many new and interesting ways to make pumpkin pies including adding cream cheese layers or drizzling caramel and pecan toppings on them. I have tried a few of these but they are often too sweet, even for my sweet tooth. I have made my pumpkin pies with fresh pumpkin, canned pumpkin, and pumpkin that I canned myself. They always turn out delicious and this is the recipe I use every year. Note: If you prefer a spicier pumpkin pie, add 1/2 tsp. ground cloves or allspice. Combine all filling ingredients with mixer and pour into unbaked pastry shell. Place a folded strip of foil loosely around crust edges to prevent over-browning. Bake for 15 minutes at 425 degrees then reduce heat to 350 degrees and continue to bake for 35-40 minutes longer (or until knife inserted 1 inch from the edge comes out clean and not gooey). Remove pie from oven and cool on wire rack for about an hour or so. Serve pie slices with a dollop of whipped cream. Refrigerate leftovers; if there are any! P.S. Pumpkin pie is also excellent for breakfast. Just saying. Copyright © 2002 Michelle Jones. All rights reserved.